This was possibly the final licensed product from the line of "Battle of the Planets" merchandise. Plus, it is the only known computer game manufactured for "Battle of the Planets." The actual game is contained on an audio cassette. The object of the game was to destroy enemy spaceships and stop their landers from creating encampments on your field of friendly planets. There were three stages to the game, space, air and ground fighting. It featured vector graphics that were fairly impressive for the time, and it began with a computerized rendition of the "Battle of the Planets" theme song. 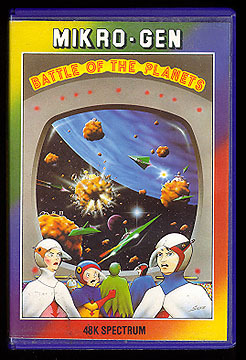 Interestingly, this game was chosen as the Space Adventure entry for England's National Computer Games Championship for 1985. If you would like to see a sampling of the graphics, click here.